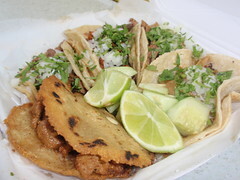 Hola, to make your Taco Truck Trek easier, we linked a list of terms to help you order the tacos and treats you want. We encourage you to try at least one new item on each trip. We also ask you to learn three phrases in Spanish: Hola – Hello; Por Favor – Please; and Gracias – Thank You. MULITAS = (“little mule”) meat served between two tortillas with melted Oaxaca style cheese, all grilled together. Chucky C – The best way to keep up on the latest events is to watch this blog. We’ll post it here as soon as it’s announced. You can subscribe to an RSS feed which should make monitoring this site easier. Great way to get started with Taco Trucks! Thank you for this list!!! One thing though, Carne Asada is Grilled Beef, not roasted beef. We have that corrected. Thanks.